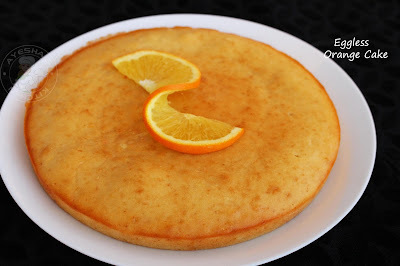 If you are looking for eggless cake recipes, then do check this eggless orange cake recipe. Yes...you can make the same airy, soft, moist cakes without using eggs. Most of the cakes are made with eggs for a fluffy and moist texture. But you can substitute the eggs with mashed banana, Yogurt or curd, butter milk depending upon the recipe. Here i used less sour thick curd instead of eggs. This recipe for egg less cake is super easy with the simple ingredients in your pantry. You can make any eggless fruit cake following the same recipe. 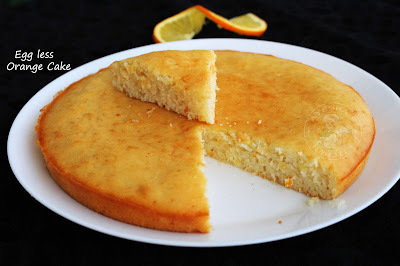 Enjoying a slice of super moist cake along with an evening tea is an enjoyable moment. So never stop baking cakes only because of the ingredient egg. 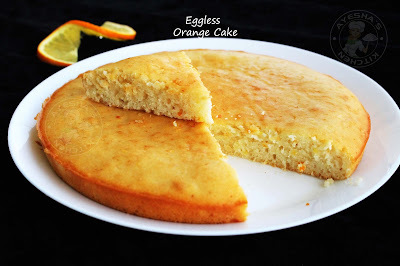 Here is the recipe showing how to make an eggless cake recipe with fresh orange juice/recipe for the eggless cake. Sieve together flour, baking powder, baking soda, cornflour, and salt. Set them aside. Now add the less sour curd in a bowl and whisk it well. To this, add powdered sugar (add sugar in a blender and powder it) and again whisk well. Add oil and whisk it, add orange juice and whisk it. Now add orange zest, vanilla essence and whisk well. Now add the sifted flour little by little and fold well gently. Do not whisk after adding the flour. Fold them without any lumps. Now pour this prepared batter into the cake pan and bake for 30 minutes at 180 degree C in a preheated oven. Insert a tooth pick and if it comes out clean, the cake is done. Let it cool and then slice. For a nice slice, refrigerate the cake for few minutes. Serve along with a nice cup of tea. Keep refrigerated the remaining cake. If you are using fresh orange juice, just make it only before adding to the batter. Else it will taste bitter (keeping orange juice for long). Some may not like the taste of orange zest. So for those..can skip it. Keep a butter paper under the cake tray while baking in the oven (as in the image). This will give a nice texture to the bottom of the cake.